Why Are Roll-Out Shelves Right For Your Home? If bending or stretching for objects stored too low or too far behind is difficult, there is a simple solution: install some roll-out shelves. Roll-out shelves present many advantages. They can be installed higher or lower, closer or further apart, according to your needs. This way you can store whatever is necessary with no worry that the objects may not fit the existing space between the shelves. If needed, you can easily uninstall and then re-install them at a different distance from each other. 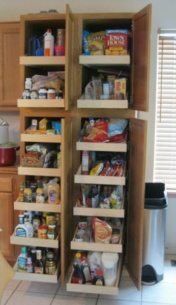 It definitely helps to get all your kitchen cabinet drawers organized utilizing every inch of space. These shelving systems are very practical and adaptable for kitchen furniture and other storage areas. Each shelve can be retrieved like a drawer and independently extended from the cabinet. They are mounted on special rails that allow sliding them back and forth manually. These shelves are also easy to adapt to any available space, as the components come in various sizes; they are lightweight, portable and easy to install, requiring only a few screws. Wherever you use roll-out shelves, you will get extra storage space, and the fact that each drawer slides out ensures full view of the shelf content and easy access to all stored items, even to those that used to be hard to reach when they were stored on traditional shelves. Original Post right here: Why Are Roll-Out Shelves Right For Your Home? We provide superbly made shelving and drawers, custom designed to convert to roll out drawers and shelving for your convenience. All of our products are custom made for your existing kitchen cabinets, pantry, bath cabinets, linen closet or drawers. Roll’em Out Shelves, a family-owned company, has been in business for 10 years. We offer custom service and we make our roll-outs right here in Colorado, which allows us to create your roll-outs exactly how you want them. We take the time to listen to what you want and will work with you until you are happy. It is our pleasure to make life easier for our customers. This simple adjustment to your living can bring convenience and organization. Our Referral Program is designed to thank those customers who have the confidence in our roll-outs and have referred us to their friends, family and neighbors. We reward them with a check! We serve the entire front range of Colorado including: Denver, Boulder, Colorado Springs, Fort Collins and everywhere in between.